Facebook has celebrated the milestone of reaching 1 billion active users by releasing its first ad and alluding to plans of a larger marketing tilt as it pushes towards its next goal – reaching another billion. 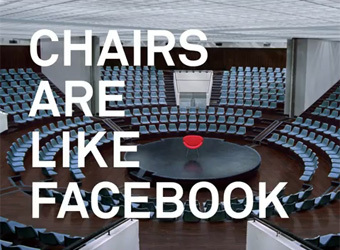 The 90-second clip, which compares Facebook to chairs, bridges, airplanes, chairs and other things that bring people together, will run worldwide on Facebook’s login page and YouTube, and be promoted on Facebook through sponsored posts and ads in 13 markets, according to Advertising Age. Promotion of the ad using Facebook’s ad tools will focus on markets identified as key for growth, including France, Germany, Italy, Spain, Mexico, Brazil, India, Philippines, Indonesia, Japan and Russia. Announcing the milestone in a blog post, CEO and founder Mark Zuckerberg writes, “This morning, there are more than one billion people using Facebook actively each month. If you’re reading this: thank you for giving me and my little team the honor of serving you. The social network’s numbers snowballed over the past few months, after it announced in August that 8.7% of its then-955 million users were duplicate or false accounts and would be culled. But despite reaching the milestone, Facebook’s stock slipped nine cents to $21.74 in yesterday’s trading, 43% below its initial offering price of $38. In an interview with the US Today show, Zuckerberg acknowledged the company was going through a rough patch. “We’re in a tough cycle now and that doesn’t help morale, but people are focused on what they’re building,” he said during the interview. The full brand announcement of the milestone reads, “Celebrating a billion people is very special to me. It’s a moment to honour the people we serve. For the first time in our history, we’ve made a brand video to express what our place is on this earth. “We believe that the need to open up and connect is what makes us human. It’s what brings us together. It’s what brings meaning to our lives. “Facebook isn’t the first thing people have made to help us connect. We belong to a rich tradition of people making things that bring us together. “Today, we honor this tradition. We honor the humanity of the people we serve. We honor the everyday things people have always made to bring us together: Chairs, doorbells, airplanes, bridges, games. These are all things that connect us.